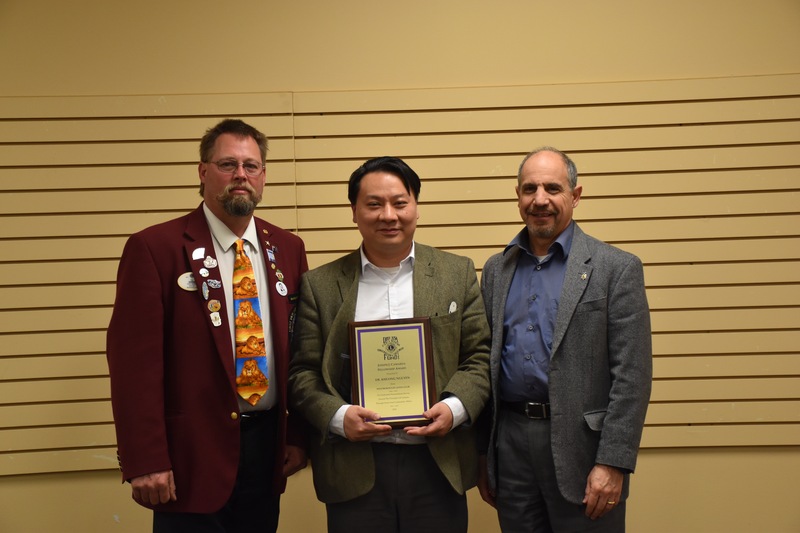 Westborough Lion, Dr. Khuong Nguyen, received the prestigious Joseph J. Camarda Fellowship Award at the club's meeting on March 16, 2016. Pictured above L to R with Dr. Nguyen at center is District Governor E.J. Sowden to his left and Westborough President Ron Pallisco to his right. This award is given to a Lion, non-Lion, group, or institution that has gone above and beyond in helping to prevent eye disease and preventable blindness. It is the highest honor given by District 33A for outstanding service and dedication to the community. Dr. Nguyen, of Westborough Eyecare, has consistently supported the Westborough community in providing eyecare and screenings to those who could not otherwise afford it. He has also been a strong supporter of the Westborough Lions club and its other charitable efforts. Congratulations Dr. Nguyen!